Few Autobots are as well liked as Trailcutter. He's always ready with joke or a reassuring word - and when neither of those will do, his impenetrable force field usually serves to improve the situation. He sometimes worries that he uses too much fuel, but the other Autobots are more than happy to take a smaller Energon ration if it means Trailcutter can keep deflecting incoming laser blasts. 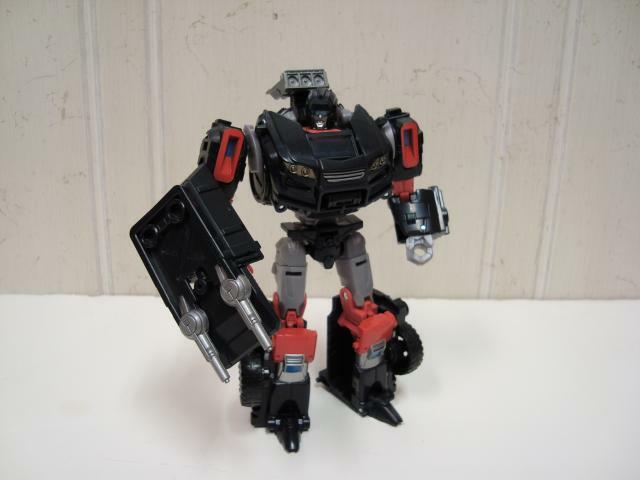 The character Trailbreaker (recent toys are named Trailcutter, presumably for trademark reasons) made his debut waaaay back in 1984 in Generation 1. He made appearances in several Season 1 and 2 episodes, and is best known for his ability to create force fields (a very useful tool in combat). Rumor has it he died in Transformers: The Movie, but I don’t believe there is any concrete continuity evidence of that. More or less he just disappeared for Season 3 on. Since G1, Trailbreaker hasn’t made very many rounds, but has recently made a small resurgence in mainstream media. Personally I don’t have much of a connection to the character, but the toy looked interesting enough for me to pick up, plus it filled a hole in my Classics collection. Maybe some of you will be thinking the same thing, so would it be worthwhile to purchase Trailcutter? 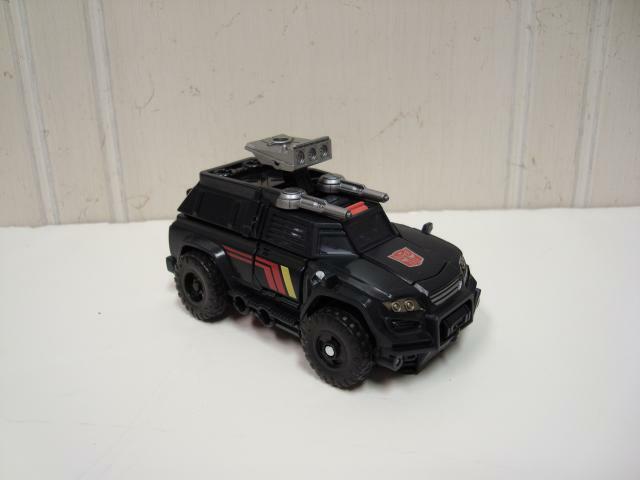 Trailcutter’s alternate mode is as it always has been: some sort of camper truck/SUV. This truck mode turns out a bit on the tiny side when compared to like-sized vehicles (i.e. 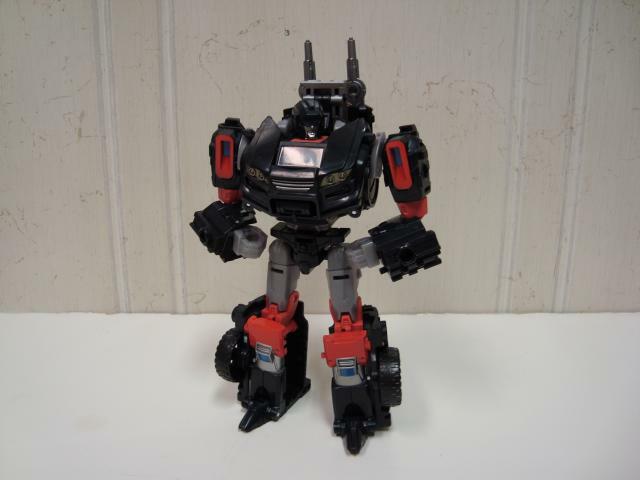 Universe Ironhide). He’d be the equivalent of a capped Ford Ranger if Ironhide is a Chevy Suburban. The mode isn’t bad per se, it’s actually quite good, just a bit tiny. For being so compact, the truck mode is really solid, and nothing is going to flop around. The parts easily tab together making a sturdy little vehicle. For an off-road type vehicle though, the robot parts on the bottom make him really low to the ground. Don’t expect Trailcutter to smoothly cut any trails on your carpeting. The molded detail is on the truck is done well, and helps break up the bland black plastic a bit. The headlights are painted gold while the guns, top lights, and grill are silver. The windshield is a transparent dark grey, and the side windows are slatted, so they don’t have any transparency. There is a large Autobot symbol on the hood, and Trailcutter’s traditional yellow and red stripes can be found running down the sides. As for functionality, the camper cap can be removed to make Trailcutter a more traditional pickup truck. The truck mode sports seven 5 mm peg holes for attaching weapons: two on each side, two on the back of the cap, and one on the top of the lights. Sadly, Trailcutter does not come with any other weapons to actually attach to the peg holes. Overall, the truck mode is solid, but not terribly exciting. After a simple transformation, Trailcutter is into robot mode. Aesthetically he fits the IDW design well. As typical with recent Generations figures, he’s a bit on the short side, but not enough that it’s a staggering difference. The head mold is quite nice and the light piping works great for a grey color. The way the light catches and shines through the visor almost makes it look metallic. Flat black plastic is all around the robot mode, but it’s broken up nicely by grey plastic, red, light blue, and silver paint apps. Trailcutter is stocky, but articulation makes him move and pose well. He’s got a fair bit of joints: neck, shoulders, upper arms, elbows, waist, hips, thighs, knees, and feet all have some form of a joint. Nothing is hindered in robot mode, but the lack of a true ankle makes some balance problematic. His weight is distributed nicely though. The knees can get a little fiddly on mine; the transformation joint hinges sideways, so when bending the knee they like to shift. I have only had one issue on the quality side of things: Trailcutter is pretty sturdy, though the swivel joints to shift the shoulder in position are incredibly tight on mine, and stress marks appeared on the wheels they attach to upon the first transformation. Other than that I haven’t had any issues with joints or breakage. 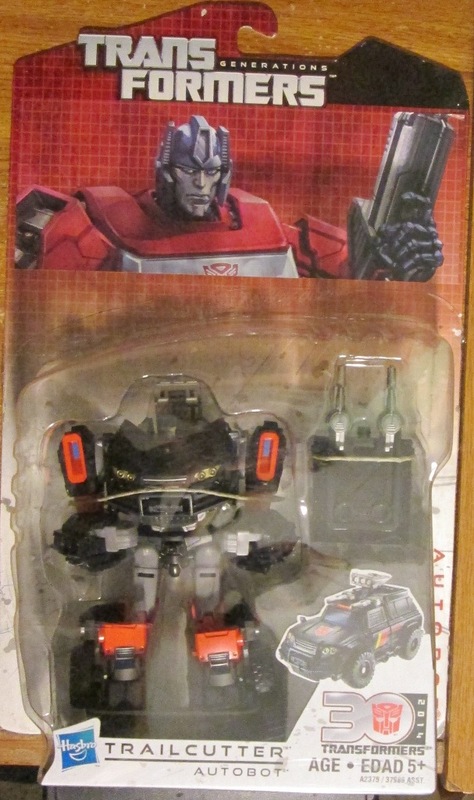 On the accessories front, Trailcutter only comes with one: a shield/double gun. It’s truly a weird weapon, and doesn’t really work for either purpose. Maybe HasTak was going for the forcefield angle by giving him a shield? Either way it had a nice handle that pegs into his hand for wielding. The shield-gun can also be stored on his back, but sadly it robs him of his top lights/force field generator. There are a few 5 mm peg holes to be used on his robot body, but again, he is weaponless aside from the shield-gun. It would have been cool to get a proper pistol for this guy. In closing, Trailcutter is a solid toy. Sadly, outside of his ability to fill a hole in the Classics line, he doesn’t offer much else. He’s another 1984 toy to be updated, and he will look good in your collection. As a bonus though, he has absolutely no kibble anywhere. All the parts were used well in this design. I can’t say either way if you should buy him or not; there are minimal QC issues, and he looks good, but the fun factor is lacking. This purchase will be solely up to your want/need of this character. Transformation Design: 6. Simple and straightforward. It isn’t difficult to design parts that fold into a boxy truck, though. Bonus points for no kibble in robot mode. Durability: 8. Trailcutter is solid. However, the shoulder joints by the wheels stressed the first time I transformed him. Aesthetics: 7. A good design, and he looks like the character model. Paint/color-wise, he’s kind of bland. The stripes on the sides of the truck add a bit though. Articulation: 8. Joints are all there, and nothing is hindered. No ankles though, and the knees end up a bit goofy (they slide sideways often). Value/Price: 7. He doesn’t do much, besides look like Trailbreaker. The shield/gun isn’t cool enough to boost this score. If you pay $15 USD for him, the value is really lacking. Overall: 7. Trailcutter is solid, and a breeze to transform, much like the early Classics figures. There just really isn’t much here to say you NEED him. He will fill a gap in your Classics collection, but other than that, he just doesn’t do much, nor does he have the character pizzazz like his wave-mates.